Mayor Andre Sayegh and Passaic County prosecutor Camelia Valdes introduced Grewal to a room of about 30 people at the New Roberto Clemente School on Nov. 29. Sayegh emphasized the importance of collaboration with the Attorney General’s Office concerning neighborhood safety while Valdes praised Grewal’s work addressing critical challenges, including the stemming of violence and immigration reform. Grewal initially referred to a press conference held earlier in the day. Convened at Liberty State Park at the concourse of the Central Railroad of New Jersey Terminal, Grewal announced his, “Immigrant Trust Directive.” The measure establishes new rules on how New Jersey law enforcement officers interact with federal immigration authorities. The directive limits the assistance that officers may provide to federal representatives, including Immigration and Customs Enforcement (ICE) officers. The attorney general was speaking in a city where more than a third of people residents are foreign born, according to U.S. Census data. 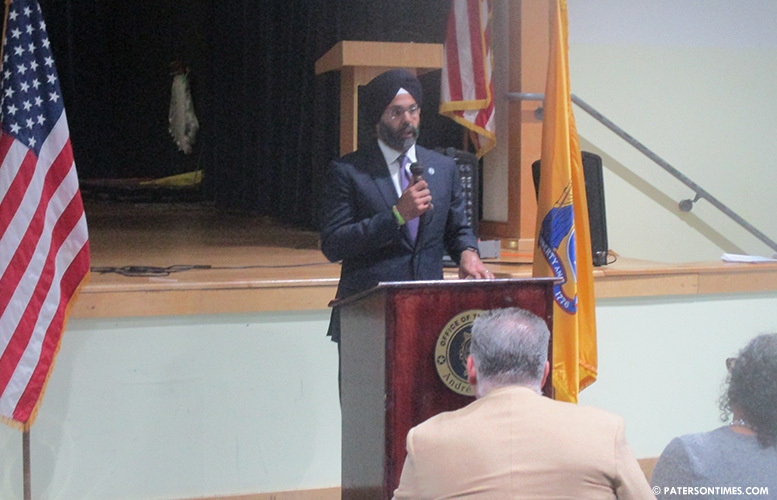 With the hope of building trust between law enforcement and communities, Grewal noted four priorities: battling the opioid epidemic, combatting violent crime, improving police-community relations, and keeping the Trump administration in check. Grewal said that inquiries about immigration status in New Jersey are “absolutely prohibited.” He said the only exceptions are “when an arrest is made or when during an investigation criminal circumstances arise.” Grewal explained that getting pulled over for a DUI does not meet the standard of a criminal circumstance. Grewal said that the recent elimination of the requirement of cash bail for those incarcerated in New Jersey has reduced pre-trial jail time and helped reduce the number of violent crimes committed. He also said he would be open to leading criminal record expungement seminars in Paterson in conjunction with the Passaic County Prosecutor’s office. Another question posed by the audience was the use of profanity by police officers when dealing with the public. In October, a police takedown of a deaf man sparked outrage in Paterson. Two women complained about police officers cursing and disrespecting them. In response to a question by Paterson city councilman Michael Jackson about the disproportionate number of African-Americans that are arrested or charged with crimes, Grewal noted his office’s emphasis on officer training.